Founded by atheist progressive John Dewey, who promoted secular humanism and ridiculed moral absolutes and traditional religion, the government (public) school system is an unsafe place to send children -- especially today in California. Unsafe mentally, emotionally, spiritually, academically, sexually and physically, today's government schools continue to promote Dewey's immoral agenda to captivate young, impressionable minds -- surely "bigger and better" than he ever imagined. Despite there being some good teachers in the government system (whom we applaud), in the end, it's a system broken beyond repair with an indoctrination agenda that is in conflict with your family's moral standards and wholesome education dreams. 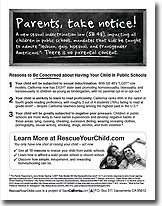 » July 17, 2016 -- Breibart.com Exposes Gay Agenda for Public schools and interviews pro-perversity leaders in article "California: 1st State to Teach LGBT Curriculum -- to 2nd Graders"
Impacting the minds, hearts and souls of children, here are 10 things every child is guaranteed in California public schools, and 10 reasons to remove them for good. 1. Homosexual-bisexual-transsexual indoctrination, without parental consent, including off-campus pro-homosexuality counseling. Currently, there are 10 different LGBT indoctrination laws in place, some impacting children as young as 5 years old. 2. Pro-abortion indoctrination, "confidential” abortion referrals and off-campus "counseling," without parental consent. There are now 10 sexual indoctrination laws mandated for children in California public schools. SEE THE 10 LAWS HERE (download 2-page law summary here). Parents who understand the reality of these laws, the negative impact on their children, and the long list of other problems with public schools, are sacrificing and doing whatever it takes to permanently remove their kids from government indoctrination centers. The 10th and most recent sexual indoctrination law assaulting children in government schools is AB 1266. This gender-bending bill allows biological boys in girls' restrooms and girls' showers, and biological girls in boys' restrooms and boys' showers, among other things. Signed by Gov. Jerry Brown on August 12, 2013, this law attacks the sensibilities of parents and the innocence of children by erasing natural gender distinctions in government schools. Learn more about AB 1266 here. This CNN interview further shows why parents are outraged over AB 1266 and are removing their kids from public schools permanently. SaveCalifornia.com President Randy Thomasson explained the reality of this law, defended the rights of children, defined civil rights, and more. On the other side, a biological woman living as a "man" celebrated AB 1266, and made some claims that have nothing to do with what this law does. Another law that has motivated good parents to remove their children from the bad influences at public schools is SB 48. Signed into law by Jerry Brown and effective since Jan. 2012, SB 48 means children as young as kindergarten in California K-12 government schools will be forced to admire "gay, lesbian, bisexual, and transgender Americans" as their personal role models. SB 48 mandates that the unnatural and unhealthy lifestyles of both historical and contemporary persons who engaged or currently engage in homosexuality, bisexuality, or transsexuality be positively portrayed to impressionable children through "instruction in social sciences." It's the most in-your-face indoctrination. Parents have NO OPPORTUNITY to OPT-OUT or OPT-IN their boys and girls! Learn more about SB 48. 1) WATCH RANDY'S SHORT VIDEO below to parents and grandparents. Parents, you only have one opportunity to raise your child. Don't delay. Distribute this eye-opening flyer to parents and grandparents in your town. Good for handing to parents as they pick up or drop off their kids outside public school campus. Simple to place on cars in shopping centers and church parking lots. California churches can and must be a major part of the solution in rescuing children. But first they must recognize the severe problems with government schools, and how these problems are working against the mission and the good they are trying to accomplish in children and teens who attend their churches. Our packet also shows churches how opening a simple low-cost church school is a vitally important mission they need to adopt. We show them how. "Overruled: Government Invasion of Your Parental Rights" is a docudrama by ParentalRights.org that exposes how government laws have power over your parental rights. WATCH THIS ENGAGING FULL-LENGTH VIDEO NOW (36-minutes).